Darby, Montana, United States Currently in ice lock up. Looking forward to a thaw in a couple of months and more big stones! MID JULY IS A PERFECT TIME FOR LOTS OF MONTANA RIVERS AND IT’S HARD NOT TO LOVE THE MEADOW SECTION OF THE GALLATIN RIVER AS IT FLOWS OUT OF WEST YELLOWSTONE PARK. Southwest, Montana, United States A Great day on the Big Hole fishing in the snow. Bryson City, North Carolina, United States Good fishing right now for white bass and walleye at the mouth of the Tuckaseege River outside of Bryson City. A few lake run Steelhead are being caught. 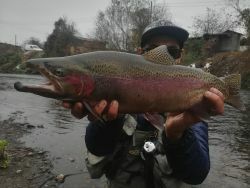 Steelhead should peak over the next two weeks.